The Book Chick: Author Interview and Cookbook Giveaway! 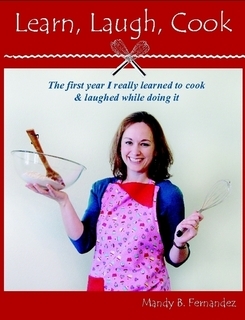 Author Interview and Cookbook Giveaway! Please join me in welcoming my friend and the author of the cookbook Learn, Laugh, Cook (my review) to The Book Chick today! Mandy has generously offered to answer a few of my questions and she's giving away one copy of her new cookbook. The Book Chick: How long have you wanted to write a cookbook for? Mandy Fernandez: That's funny you ask that. I NEVER imagined I would write a cookbook of all things! Since I was a child, I always knew I wanted to be a writer and hopefully an author of a book someday. However, I never dreamed of writing a cookbook. A year ago, I went from being a full-time working mom in a fast paced corporate environment to a full-time stay at home mom in a wacky, toddler environment! I needed order in my new chaotic world so I began with meal planning and cooking at home. It helped me save money and free up my time to do other things. Soon I was sharing great recipes with family and friends. A few months later, the idea for a cookbook was born. My cookbook isn't your ordinary book with just recipes though. There is a lot of humor in it. I have silly poems written about food, such as how Mexican gives me the runs and how onions make me cry. I also shared a story of how I took a barf bin and turned it into a measuring cup. So it's something that can appeal to anyone, not just cooks or moms like me! TBC: How long did it take you to put it together, from start to finish? MF: Exactly a year. I began my culinary adventures in November of 2009 and I published this book in November of 2010. The first eight months were just tracking my favorite recipes and my misadventures in the kitchen. I became serious about putting together the book in late August. I worked non-stop in September, October and early November putting it all together. TBC: What's your favourite thing about cooking? MF: I like the creativity it offers! When I'm having an off-day or stressful moments, I'll often bake something I love, such as chocolate chip cookies or blueberry muffins. A great-smelling house and a delectable dessert is sure to put me in better spirits! I also really love sharing my cooking disasters and how I learn from them. They're ongoing and hilarious and I'm not afraid to poke fun at myself. In my cookbook and on my blog, http://www.learn-laugh-cook.blogspot.com/, I will declare myself a "Loser Cook" and share photos of my not so good looking dishes. It's all in good fun and I hope others will laugh along with me (or at me) and become courageous to try their own new meals. TBC: Okay, so you have a potluck to go to. What do you bring? MF: I love casseroles! I love dinners where there is a little bit of everything in there to make a wonderful, complete meal. I'd probably bring my ham and potato casserole or my "Man's Italian Meat Pie" which are two of my husband's favorites. If he loves them, then anyone else would too! TBC: Any plans for a "Learn, Laugh, Cook 2"? MF: I'm thinking about it. The idea certainly does appeal to me since I'm still learning, laughing and cooking each day. However, I'd like to be open to other creative projects as well. Time will tell, I suppose. I like to have options and I'm taking things just one day (and one new recipe or cooking disaster) at a time! 1. *Mandatory Entry* Share one of your funny cooking stories or disasters. The person who makes me laugh the hardest with his/her story will receive one additional bonus entry! Please leave me your e-mail address so that I have a way to contact you if you win. No e-mail= no entry! 2. *Bonus Entry* Follow this blog through Google Friend Connect and let me know in a separate comment that you now follow. Current followers are eligible as well, just leave me a separate comment letting me know that you already follow. 3. *Bonus Entry* Follow Mandy's cooking blog, Learn, Laugh, Cook through Google Friend Connect and leave me a separate comment letting me know that you now follow. Current followers are eligible as well, just leave me a separate comment letting me know that you already follow. 4. *Bonus Entry* Spread the word about this contest in some way. Blog about it, post it in your sidebar, Facebook or Tweet about it. It doesn't matter how you choose to spread the word, just leave me a separate comment with the link to what you did. It's that simple to enter! This contest will run until January 5, 2011 at midnight, and the winner will be notified by e-mail. The author will be shipping the book directly. Good luck! This is about my husband because I don't have crazy stories of my own. He was making sweet and sour chicken for Shabbat dinner and put big chunks of pineapple on top of the chicken. Apparently, the pineapple covered it so much that the chicken didn't cook all the way through. I'm glad I caught that before we all got food poisoning! I'm following Mandy's blog now. When I was young and still living at home, I made a birthday cake for my dad. Decorated it beautifully and picked it up to take to the dining room and proceeded to dump it upside down on the kitchen floor. He never even got to see the finished product. We used to have a small pot that was just used for melting butter for popcorn and such. One day my mom used it for garlic butter over pasta. I was making glazed sticky buns for dessert and reused the pot, not knowing it was garlicy. Those were some interesting sticky buns! I follow Live Laugh Love on GFC. I was preparing for a good crowd and was wondering what to make so I consulted with my grown daughters and they advised me what to make. I made a concoction in the crockpot, as well as a noodle pudding. They were helping me assemble the two dishes. The food was cold, raw, inedible and like medicine. That is the last time I get input from my daughters. When I was in high school, I was sent to the grocery store to get a pie crust to make quiche and came home with a graham cracker crust! Newly married and I put a roaster chicken in the oven to roast minus the stuffing. The bird was frozen. Mom and Dad butchered chickens and gave us some Fryers and some Roasters. The fryers were cut into pieces and the roasters were left whole but cleaned. Halfway through I decided to check the chicken and upon opening the roaster lid I yelled to my then dh "the chicken exploded". The bird was laying in pieces in the roaster. Here I had taken a fryer instead of a roaster and upon some cooking the pieces started falling away from each other. I thought my roaster had exploded. That is how naive I was. My grandma and I were chatting one day and decided to boil some eggs. We put them on to boil and went into the living room to continue chatting. We got engaged in our conversation and forgot all about the eggs until we heard a loud boom. We ran into the kitchen to find egg all over the ceiling. They had boiled dry and exploded. I am now following Mandy's blog too! I posted to my blog too! My mother graduated college with a degree in Home Economics Education. She also entered her cooking, baking and canning at the local fair, and won most of what she entered. Later she became a judge at the same fair. With a mom who was known for her cooking I didn't have any trouble coaxing friends, and more importantly boyfriends, to my house for dinner! One especially important 'New Boyfriend' dinner was planned, prepared and served. We fixed a pork roast, mashed potatoes with gravy, homemade rolls, fresh green beans from the garden a wilted spinach salad, and lemon meringue pie for dessert! It was going to be aMAzing! We began fabulously, good food on the table smelling heavenly, good conversation, until New Boyfriend took a bite of the salad first. We saw a strange look on his face as he chewed. Oh no! he Doesn't like it! We asked and he said he was unaware that spinach was crunchy. YIKES -- we forgot to rinse the spinach first, there was still sand in it! On to the rest of the dinner... The pork, potatoes and gravy were not cooked as his mom cooks them so did not pass the test well. And then New Boyfriend tried to cut a piece of butter from the stick for his roll and promptly broke the plate from the force of trying to cut real butter that was still very cold... Well, the desert would make up for the dinner we were laughing over. Desert was brought to the table. The meringue was supurb! I made a show of cutting and giving New Boyfriend the first slice to watch in horror as it dripped from the serving piece and the pie proceeded to fill in the cut out portion. We ate Lemon Meringue soup in a bowl for desert! New Boyfriend was not impressed... and didn't request any more home cooked meals. My family did have a good laugh every time after that when Mom fixed her now famous Lemon Meringue--is it soup yet? One time when I was first married, I made chicken with red wine instead of white. When it came out, my husband said, "It looks like a fetus." I can laugh now, but needless to say, I couldn't eat the chicken.! Once i made Sliver Margartitas. I had been making margaritas in the blender and i know your not suppossed to stick spoons or anything in but our blender was old and i had done it before. The wooden spoon got caught and there were tiny slivers of wood mixed in with the margarita seeds. Not yummy!